Ross Alexander is the new dean of the Indiana University East School of Humanities and Social Sciences, beginning January 1, 2015. “Ross brings with him a wealth of knowledge, leadership and a solution oriented approach to the position of dean. As interim dean and associate vice chancellor, Ross has established a familiarity with the campus, faculty, students, and the community and he is a strong advocate for the school. I am delighted to welcome him in his new role,” said Chancellor Kathryn Cruz-Uribe. Alexander has been the interim dean since July 2014. 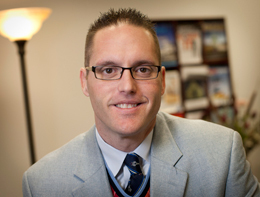 He joined IU East in January 2012 as the associate vice chancellor for Academic Affairs. He also served as the dean of Graduate and Extended Education. The dean of the School of Humanities and Social Sciences has the administrative responsibility for all aspects of the school, including faculty recruitment, development and evaluation; program development, assessment and improvement; student recruitment, retention and success; budget management and fundraising; and other matters related to the continuing well-being of the school and its faculty, staff and students. Alexander received his Ph.D. in Political Science with majors in Public Administration and American Politics and a minor in Political Theory from Northern Illinois University. He received his Master of Public Administration from Arizona State University and his B.A. from Beloit College where he majored in Political Science and History. Before joining IU East, Alexander was the department head of Political Science and Criminal Justice from 2010-2011 and the assistant department head from 2009-2010 for the North Georgia College & State University in Dahlonega, Ga.
Alexander formerly held positions at the university as an associate professor of political science and the co-director of the Quality Enhancement Plan. Previously, he was a visiting assistant professor of political science at the Dominican University in River Forest, Ill., and an instructor of political science at Northern Illinois University in De Kalb, Ill., where he began as a teaching assistant with the department.